Sonus Faber unveils high-end Homage Tradition range of speakers | What Hi-Fi? The Homage Tradition updates the Amati and Guarneri speakers from the company’s iconic 1990s Homage range and introduces a brand-new Serafino floorstander. Showcased at the KJ West One high-end hi-fi store in conjunction with specialist UK distributor Absolute Sounds, Sonus Faber claims its new Homage Tradition collection is designed to combine the best of classic Italian design with contemporary luxury style - while introducing improvements to sound quality along the way. The new Tradition range features two of the Italian company’s celebrated Homage speakers – the Amati floorstander and the Guarneri standmounter, which have been redeveloped and redesigned across various iterations since the 1990s. Joining them is a brand-new 3.5 way floorstander, the Serafino. Continuing the tradition of naming its speakers after famous Italians, the Serafino speakers pay tribute to Santo Serafino, an 18th century Venetian master of violin-making. Another speaker - called the Vox, and presumably the centre channel speaker - is due to be announced too. All speakers feature new components and designs, and finishes inspired by or developed from the Italian manufacturer’s flagship trio of speakers: Aida, Lilium and Il Cremonese. The speakers all feature a lute-shaped design, which gives the speakers larger volumes and allows the cabinets to better control internal resonances. A new bass reflex system called, rather dramatically, 'Stealth Ultraflex', consists of a wave-shaped aluminium duct at the rear of the speaker to help control airflow and minimise distortion. The speakers also feature ‘Silent Spikes’ – metal spikes that are built upon the company’s patented Zero Vibration Transmission (ZVT) system – which decouple the speakers from the floor and further minimise unwanted resonance. Additionally, the Guarneri standmounter comes with stands made entirely from carbon fibre. The Home Tradition speakers are available either in red (which consist of walnut wood with black inlays, combined with brushed black aluminium and black leather) or a new wenge finish (which has maple inlays, with brushed aluminium coated in a titanium finish and brown leather). For all that effort, you’d expect the speakers to come with a rather high price tag. And you’d be right. 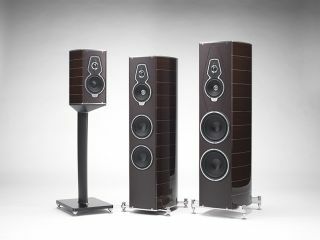 The Amati 3.5-way floorstanders cost £23,500 per pair, the new Serafino speakers are £18,000 per pair, and the standmount Guarneri are £13,600 (stands included). They're all available to buy now from Absolute Sounds.